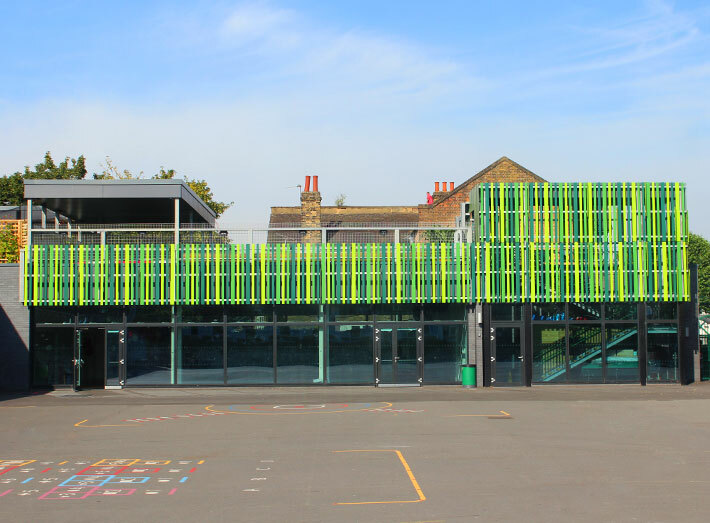 Earlham Primary School in Stratford, London, was being refurbished. The school was looking for outdoor furniture that could stand up to the rigours of school life and create flexible spaces. 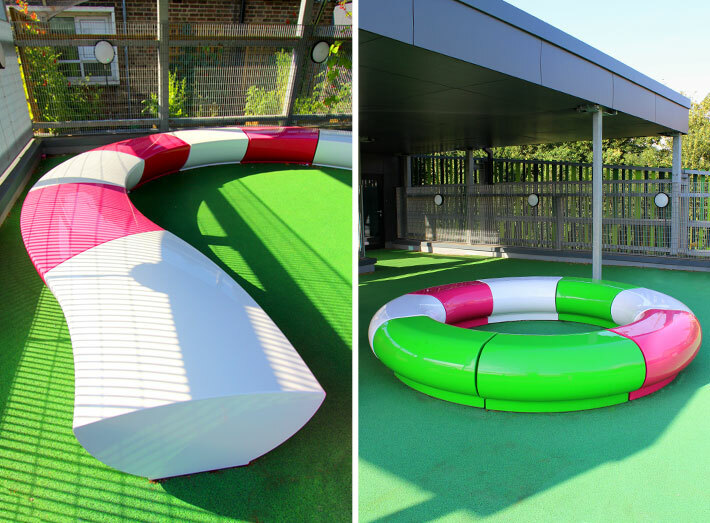 Glen Hall, Site Manager, Earlham Primary School wanted to create colourful fun spaces for the children to engage with their learning and play. 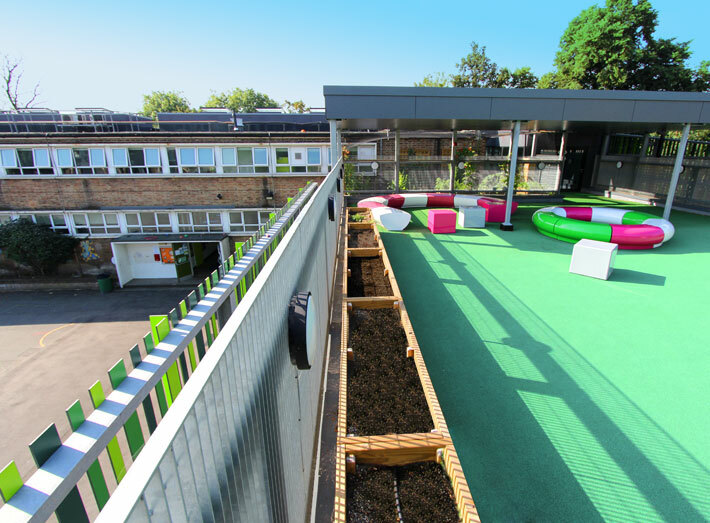 He explains: "The school benefits from a spectacular roof terrace and we wanted this area to be enjoyed by the children for quiet time during play, or for outdoor learning." GeoMet Added Colour, Functionality and Class! GeoMet's outdoor furniture was perfect for the school. Each piece is handmade and composite moulded, which makes it very hardwearing and weatherproof with minimum maintenance. The school was also very excited to receive an extra special Halo seating option, which had previously taken centre stage as an exhibit at the Chelsea Flower Show. Glen Hall, says: "We love the fact that our Halo has been at Chelsea, it gives our roof top terrace a real touch of class! We also specified a number of other pieces to complement the Halo, such as curved Serpentine seats and multi-functional Cube seating/tables." "All pieces are modular in construction, which makes it really easy for us to re-configure the space for multiple uses. Recently we've held class debates on Europe upon the Halo. At other times we've created a calm space for children to read and play board games." The GeoMet collection has proved very popular and incredibly durable; in fact it looks as good now as it did on day one. The pieces work together to create a functional space that can be adapted quickly to suit the school's needs. 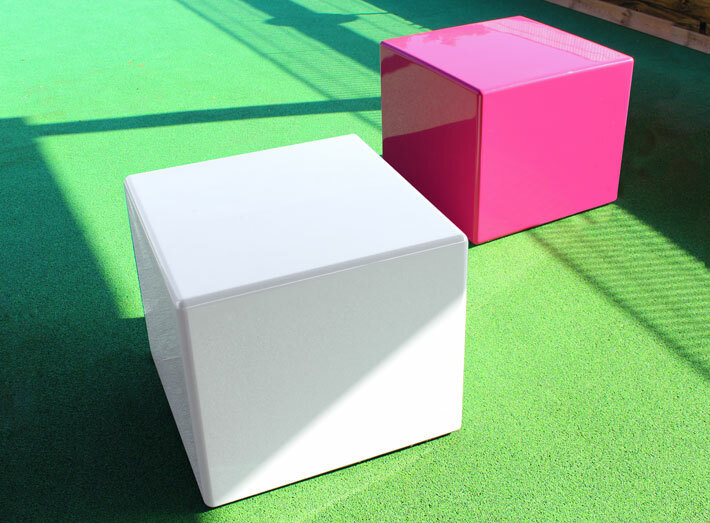 Cube seating is a simple box-shaped design offering the utmost in style and functionality. It is a modernistic range of seating, tables and planters which are functional yet striking in their simplicity and design. 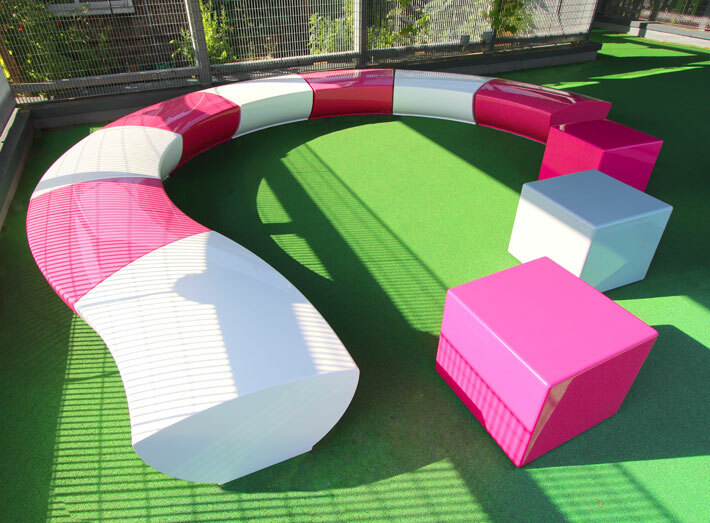 Serpentine seating creates ultimate impact in any environment thanks to its straight and curved modular seats that can be put together to create limitless designs. 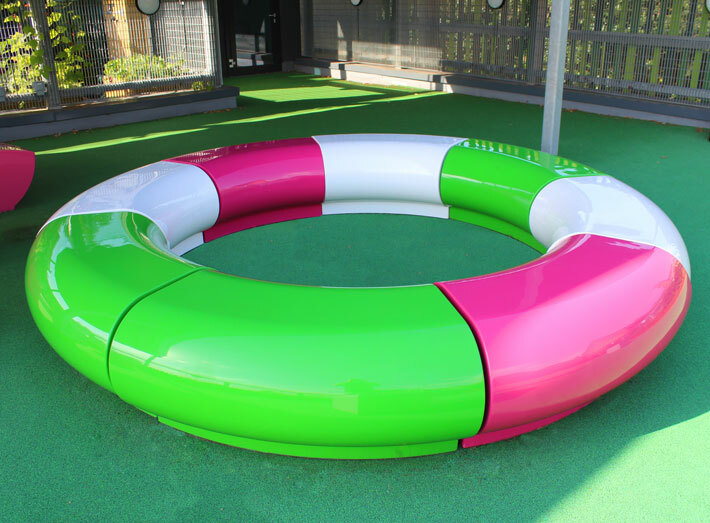 Halo seating can be fitted together to form a circle or can be designed to snake around outdoor or indoor features. Each item can be made in a BS/RAL colour to match any colour scheme or corporate interior. Earlham Primary School in Stratford, London, created colourful fun spaces for children to engage with their learning and play. GeoMet's outdoor furniture was perfect for the school, very hardwearing and weatherproof with minimum maintenance. 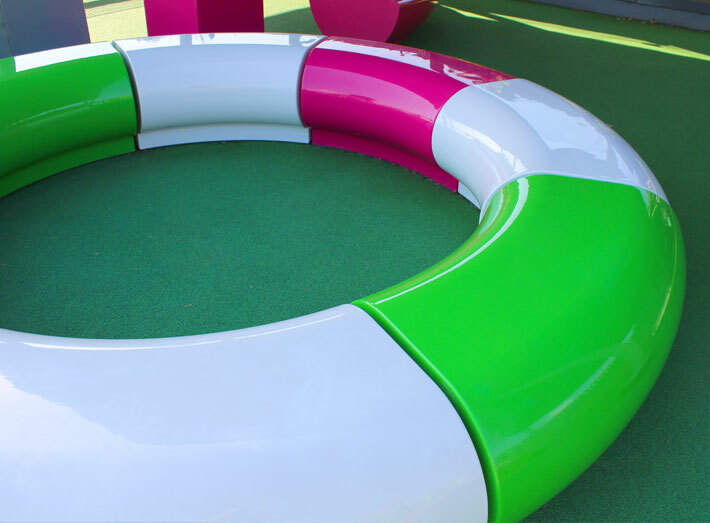 Halo modular seating can be fitted together to form a circle or can be designed to snake around outdoor or indoor features. Serpentine seating creates ultimate impact thanks to its straight and curved modular seats, put together to create limitless designs. The school specified a number of seats to complement the Halo, such as curved Serpentine seats and multi-functional Cube seating/tables. Cube is a simple box-shaped design offering the utmost in style and functionality. It is a modernistic range of seating, tables and planters which are functional yet striking in their simplicity and design. Seating designed for commercial and residential use, either indoors or outside; the GeoMet range offers an alternative to traditional timber, aluminium, PVE and plastic furniture. Left - Serpentine seating. Right - Halo seating. 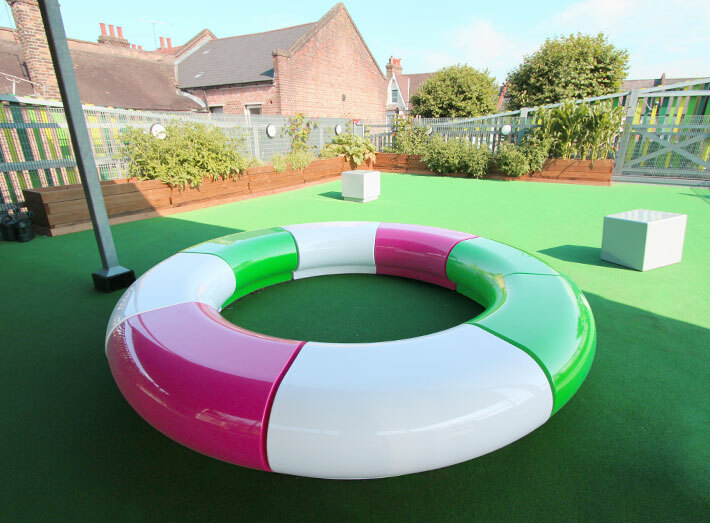 The school specified outdoor furniture that could stand up to the rigours of school life and create flexible spaces. The school benefits from a spectacular roof terrace to be enjoyed by the children for quiet time during play, or for outdoor learning. 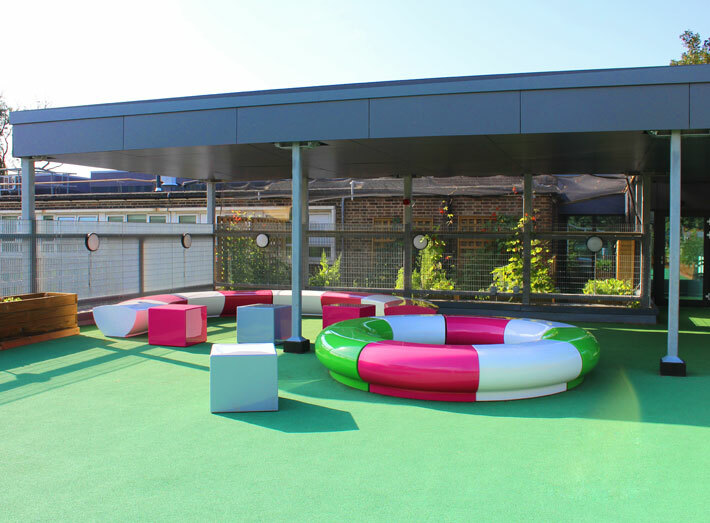 "We love the fact that our Halo has been at Chelsea, it gives our roof top terrace a real touch of class! We also specified a number of other pieces to complement the Halo, such as curved Serpentine seats and multi-functional Cube seating/tables. All pieces are modular in construction, which makes it really easy for us to re-configure the space for multiple uses. Recently we've held class debates on Europe upon the Halo. At other times we've created a calm space for children to read and play board games."